Ever since my iphone started telling me how long I stare at its screen each week, I’ve been thinking more about my scrolling time. I spend a lot of time outdoors, love cooking and making things, and have a job that’s not always at the computer. So I considered myself a not ‘too into my phone’ person but I’ve begun to realise this might now be the case! When I have a spare few moments my scrolling is an instant movement: I’m waiting for someone, a friend’s nipped to the loo when we’re out for drinks or I’m waiting for the kettle to boil... that’s when I start to scroll. As my thumb drags down the screen, my eyes stare through into the lights and colours of my phone and I begin my scrolling. My thumbs follow the same worn path: Instagram, my emails, Pinterest, Twitter, Facebook. Each time I’m transfixed and journey down a scrolling rabbit hole. I’m not anti-technology and I really like the way lots of apps are platforms for creativity and useful information. I think it’s great that our phones are a port-key to communities and groups of people we would otherwise never be able to talk to. What I’d like to understand is why I ‘mindlessly’ scroll and ways I can get my time back from doing this, and spend it on what I really enjoy. The scroll time on our phones is relevant to our jobs and lifestyles so one person’s stats can’t always be compared to anothers. The last thing we need is something else to feel guilty about! So I’m learning about scrolling so I can understand why it’s so addictive. I’m hopeful that the more I learn the less I’ll scroll! Even before I looked at the numbers in my Settings, I knew that my scrolling needs to be reduced. When I looked at the Screen Time info in the Settings section on my phone, I was astonished about being on my phone for that long each week. Initially, I thought of the excuse that I do use my phone for work but looking at the breakdown of time I spend on my apps, I'm sure most of that isn’t productive ‘work time’. Even being shocked by seeing the time I spend on my phone, my hand still reaches out to it throughout the day. Below I’ve written 4 ways, as a pep talk to myself, to help me scroll less. If you feel like you could do with scrolling less, I hope you find the list below useful too. Considering the stats on the amount of time I spend on my phone, I still have that nagging feeling that I haven’t replied to all my whatsapps and messages by the end of the day. I'm going to start using my phone for what I initially needed it for in the first place, messaging my family and friends. I’m aiming to change my thumb’s habits to not open Instagram first but reply to and message my friends and family instead. At the moment I keep picking up my phone because there’s someone I need to message or reply to but then I also add in a bit of scrolling on the gram time before I get round to it, and before I know it I’ve forgotten why I picked my phone up in the first place. So this step is an intervention to help me change this. A study at the University of Sussex showed that reading reduced stress levels by 68 percent. You can read more about this study here in the Telegraph. Because books are so much more calming than my phone, I’ve started to put books in the living room, by my bed and near my desk, which are the 3 main problematic areas where I scroll the most. I’ll return home from a day out and slump on the sofa to reach for my phone and begin looking through Instagram stories or Pinterest images. If my phone is in the bedroom I find myself lying on top of my bed and looking through the classic list of apps my thumb travels automatically towards. In the scroll danger zones in my flat, I’ve put a book in these places to stop me travelling down the scrolling rabbit hole. Putting books all over the place has helped me pick up a book and rest my eyes from that blue light. I've found it's really calming to reconnect with ink on paper and the stories waiting to unfold in front of my eyes. I’m still working on this but I have already started reading Tara Mohr’s Playing Big which is on the table in the living room, The Power by Naomi Alderman which I'm taking everywhere with me, and in my bedroom is J.K.Rowling’s Tales of Beadle the Bard. I’ve got through a good few pages of those already and as I start to realise the benefits I hope I read even more! When I built up the courage to look at the Settings on my phone and saw how many hours I've been on my phone each week it opened my eyes to how precious my time is. I've realised I need to learn about my own scrolling habits to understand why I scroll, how I scroll and ways I can reduce my scrolling. Looking at the amount of time on my phone has got the ball rolling to get myself to make small changes. Seeing the reality of something in numbers has helped me look back on my week and how much I scroll. Having numbers and stats sets a benchmark for a new goal and shows actual measured improvement. As I go on my scroll less quest I'm going to track my scrolling time each week. I’ve got lots of things and bits and bobs that I’ve been meaning to alter, mend, make, varnish or customise. I always feel the need to make and mend things on an idyllic rainy Sunday afternoon. But when that rainy Sunday afternoon arrives there’s always something else to do. So I'm going to reduce my scrolling time and instead spend a few minutes on my ‘for a rainy day pile’ each week. Instead of scrolling the Gram or Pinterest and comparing myself to other people’s holidays and interiors, I'm going to work on my own craft projects and plan my own holidays. So this is the start of my scroll-less quest. I tried to give up scrolling completely in January but that didn’t work. Instead, to tackle this challenge I’m going to learn about it from the inside out. Understanding something helps me to change my habits around it and I’ll be posting a few more blogs to see how my scrolling journey comes along. But for the time being I’ll be trying my best to actually reply to messages, I’d love to hear from you if you’ve got any scrolling advice or if you have any questions about scrolling that you’d like me to investigate. Please get in contact with me here. 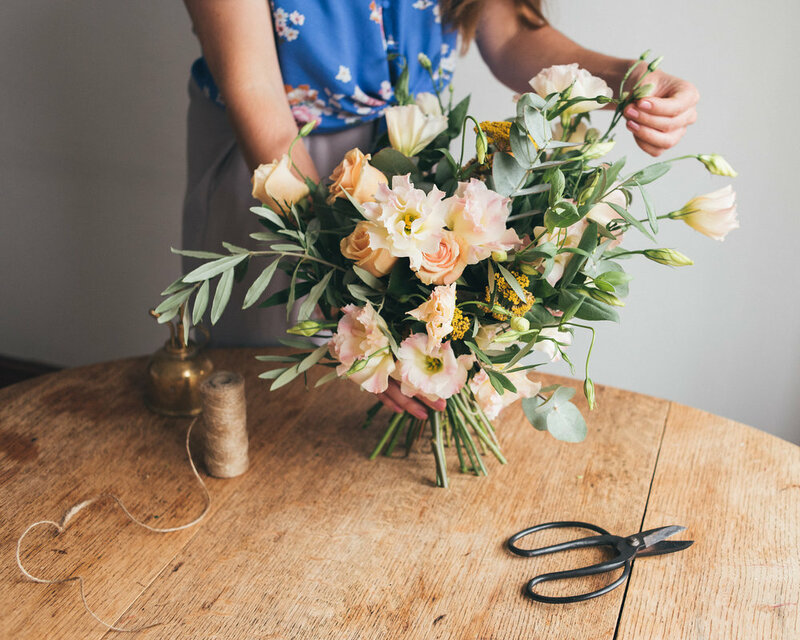 Here’s a guide to arranging flowers in a vase at home.